Wines from Texas, Seriously? Seriously. I’ve been spending some time in San Antonio visiting good friends of ours over the last weeks. While seeing the friends and their dogs was the main reason, the sunny weather was definitely also very welcome. Sitting on the porch in a T-shirt definitely beats Michigan at the moment…but today, I am heading back to snowy Michigan so it was time to publish this piece. As you may know, I have been quite intrigued by the fact that every single state in the US now produces wine (they count fruit wines as wines, that is why!). So I was naturally curious to try some Texan wines. And I did. And I did have some good experiences that I want to share. According to the Texas Wine And Grape Growers Association, Texas was the site of the first winery in North America. Yes. Franciscan priests established it in 1662. 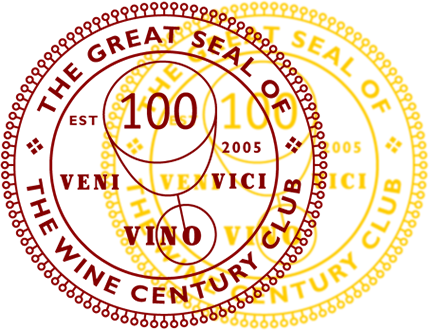 Today, it has 4,400 acres (1,780 hectares) of land under vine. 273 wineries and over 400 growers produce 1.4 million cases of wine, which makes it the fifth largest wine producer in the US. I was quite impressed when I read those numbers: The area under vine is more than half the area that forms the Rheingau region in Germany. Apparently, the climatic conditions are compared to Portugal, with sunny and dry weather. The harvest time is usually at the end of July, two months earlier than in California! 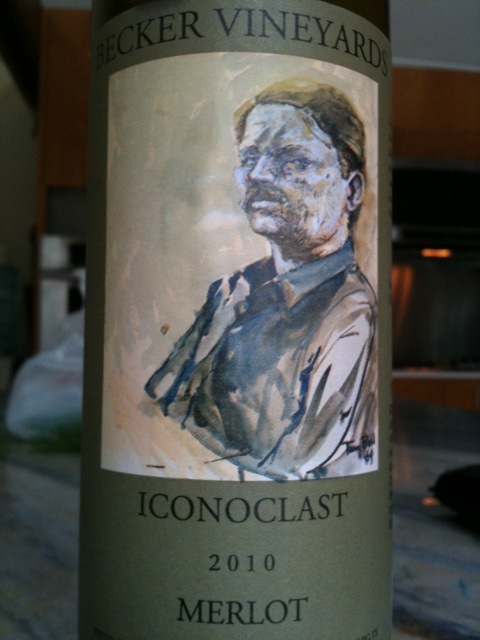 The first wine I picked up at Trader Joe’s: the 2011 Becker Vineyards Iconoclast Fascination Red. The wine has 13.2% ABV. Weirdly, the wine is not featured on the company’s website. The label just states it is a blend of their red varietals. The wine poured dark red and the initial nose was dominated by oak, and the first taste rather harsh. We dumped the wine in a decanter for a good 45 minutes, and then retried. It had worked. The smokiness was now nicely integrated with dark fruits. The wine had some interesting spice aromas which reminded me of a forest. This herbal spiciness was a distinguishing factor for that wine and helped it a lot. I thought for 10 bucks this was a great value. The winery told me later via Twitter that this is their bestselling “not so bold” red. I told them that the “not so boldness” was what I liked about it. During my next visit to Trader Joe’s, we picked up another of Becker Vineyards wines, the 2010 Becker Vineyards Iconoclast Merlot. The wine has 13.92% ABV. Again, this wine is not featured on the winery’s website. The wine poured in a lighter red. On the nose, it is quite jammy, with sugar and cherry aromas, maybe some red berries. On the palate, this medium bodied wine proved itself quite aromatic, with intense flavors of wood (quite smoky, but not unpleasant), tobacco, pepper, and some residual sugar which nicely balanced the smokiness. With a healthy acidic touch, it was different from your usual mellow Merlot. The finish was medium long. In a way, this wine reminded me of how I imagine the rougher countryside of Texas: some edges, some smoke, but sturdy and holding its ground. I don’t know whether that is just my imagined Texas, but to me it made sense. Would not be my go to red, but definitely a good experience. My friend, who likes smoky wines, enjoyed this quite a bit. Becker Vineyards website is here. 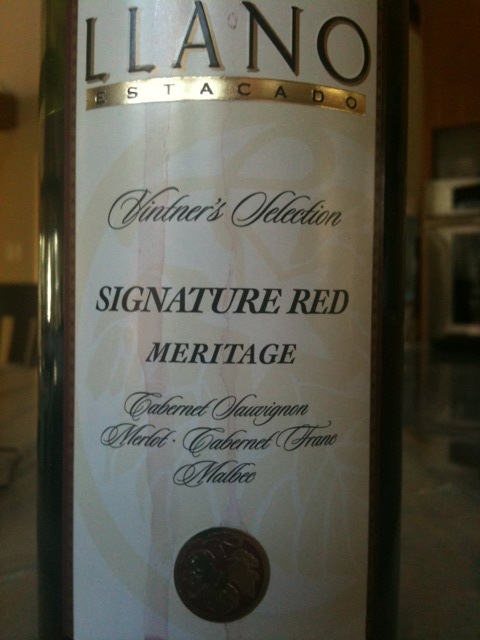 The third bottle comes from Llano Estacado Winery, their NV Llano Estacado Winery Vintner’s Selection Signature Red Meritage. The wine has 12.9% ABV and is composed of the classic combination for a Meritage: 52% Cabernet Sauvignon, 31% Merlot, 10.5 Cabernet Franc, and 6.5% Malbec. In the glass, a surprisingly light colored red wine presented itself. In the nose there were sweet cherries, some light smoke and hints of liver sausage (don’t laugh!). Initially, the wine showed rather strong bitter aromas, which were actually not a turn off (even for me, who normally does not appreciate that!). These were filled up with cherries and some acidity. The finish was very short, leaving just aromas of bitterness (in that case unpleasant). All in all it was pretty disappointing. I would not even have guessed that this wine was a blend of Bordeaux grapes. It seemed flat and not very inspired. From a quick glance around the net, other reviewers seem to have mixed feelings about this wine, too. Llano Estacado Winery’s website is here. First, even if you have to charge money for even a sampling under Texas liquor laws (which seem the insanest that I have yet come across, but the I am certain there are even crazier ones out there) you simply cannot offer a thimble for $2. That’s just not gonna work…and charging $8 for a glass is also pretty steep. And third, I wish the organizers would stick to their published schedules. It happened to us twice in one day that we showed up for a tasting only to be told that it was going to start an hour later…that is kind of annoying during a fair when you walk around and plan your activities accordingly. So you found Stetsons, belt buckles and leather boots “quite hilarious”. I’m so happy we could amuse you and as a native Texan, I will hope you choose to vacation elsewhere in the future. Thank you for perpetuating the notion that all Texans are unsophisticated and uneducated when it comes to their wine selections. You have also perpetuated all my notions about wine snobs, if it’s at all possible to be, seeing as how you are from Michigan. You are one up on me, I have not had the honor of having a Texan wine, but it does sound like you had a wonderful time and got a chance to experience something new. The cold weather may have made your reunion even that much more enjoyable. There is something to snuggling up under a blanket and watching some good old TV. :) It was a great time down South. What a rowdy experience! Texas is definitely a place of its own, and fairly indescribable (although you did quite a good job describing it). Of course it makes sense that they should be able to produce decent wines there and I’m glad to hear that they finally are doing that. Did you have Mexican food, or Tex-Mex? Most, but not all, of the restaurants in Texas serve Tex-Mex; I love both. But if pressed to choose just one, I’d pick Tex-Mex for its zip and pizazz. The food is definitely what I miss most about Texas, besides my friends (I always miss my friends terribly). Wishing you a safe journey home and a happy reunion with your true love. I am very glad you had a pleasant visit to our state and the weather was nice. The next time you are here you should visit some of the wineries just north of San Antonio near Fredericksburg. Becker Vineyards is in the area. I too prefer the Becker wines over Llano and Messina Hof. Too bad the wine tasting at the rodeo did not turn out well but consider that rodeos and wine do not always go together in Texas. Cheers! Glad you had a great time in San Antonio! Next time you visit you will have to try to get to Austin too :) Wine and tacos-just sayin’. For Tx wine, Duchman Family Winery is pretty good as well. Take care and have a safe trip back to the North! Did you have any Texas wines, Julian? And in Munich it seems to be impossible to find good US wine at affordable prices. Most wine here comes from California and is either really cheap and undrinkable or very, very expensive..
Did you leave Texas with a ten gallon hat, cowboy boots and a large belt buckle? C’mon, tell me you did! I too, love trying regional wines when I travel – but hard to do with only two on the menu! We can’t get many (any?) Texas wines up here in not-snowy-at-all-for-two-straight-winters Philadelphia, but i have heard that the state is putting out some really good juice. Unlike you, though, I do not have any good friends to visit down there so I am not so sure I will taste any of their wines soon…. I’m not sure I’ve ever tried a Texas wine . . . but what fun! One of the first things I do when we’re traveling is scope out local wineries. And local food. For me, travel is all about eating and drinking! Salud! Just travel? :) For me, home is also about wine and food…but I get what you mean. I had real Mexican food for the first time in my life. Incredible!